... well, we here at BESTbooks tried long and hard to come up with a title that didn't sound dumb, or stupid, or both, but the fact is that many of us are from the states, and we are still trying to recover from the variety of pies we were forced to try over this past weekend. perhaps we'll be able to come up with something better tomorrow. in the meanwhile, it might be nice if we explained to you what the heck we're doing here today. indeed, what we will be doing here tomorrow, and every day between now and christmas eve. in the spirit of sharing, we have decided to share with you certian books that are or shall be on sale this month. each day, a new member, a new book, a new sale. i, your humble narrator (whose day is the 22, please do mark your calendars) shall guide you through the delightful and often bizarre world of books as brought to you by selected BESTbooks members. UberArt, as she is known around the internets, can be found on etsy or apparently in North Carolina, the land that spawned Krispy Kreme doughnuts, just in case you were wondering. what North Carolina has also spawned is a delightful young woman known as Beth, who tell us she has a masters degree in Art Therapy. her books certainly work for me. 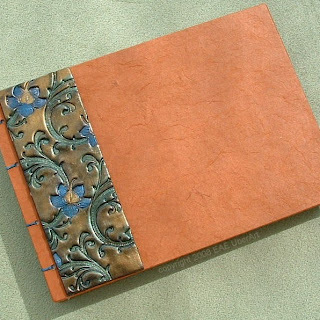 the love shot above is but one of her classy journals that are for sale this month. and what might that sale be anyway? free US shipping when you order between december 1st and 15th, with discounted shipping offered for international buyers. so what are you waiting for? get the heck over there! What a great idea. Beautiful example of her work. Love it.